New equipment components are developed to improve web quality overall, optimize process economics by fibre saving and also increase line capacity and are relevant to all bonding techniques. In recent times advances have been made in the areas of fibre opening/blending for longer staple fibres, carding to give increased versatility within one machine, crosslapping at higher web infeed speeds and needling at the critical first loom to give better control of bulky webs. Process development is also considered important. Two examples are the compact line and the HyperTex concept. In addition to wide needling lines for the economic production of large volumes for automotive and geotextile applications, DiloGroup offers a new compact line designed to make smaller quantities of high quality needlefelt as required for medical applications or when processing high value specialty fibres such as carbon for automotive/aeronautical and other uses. HyperTex produces multilayer felts to increase fabric stiffness for applications such as roofing material, dust filter bags, geotextiles and composites. 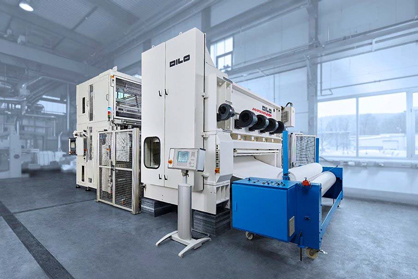 Using the scrim making machine of Ontec Automation GmbH a reinforcing layer of yarns or filaments is fed inline between two layers of web or preneedled batt. This structure which can also be limited to one fibrous layer is then bonded together at high speed using Hyperpunch needling technology. These and other fibre processing and nonwoven fabric related topics can be discussed in detail with DiloGroup during Techtextil at our booth No. 2423.